Sahil Alloys and machine tools are impersonating the CNC Plano milling machine is suitable for components of ferrous and non ferrous metal like carbon steel, low and high alloy steel and cast iron. It required for machining of bearing GBC of steam turbine of 200 MW to 500 MW. 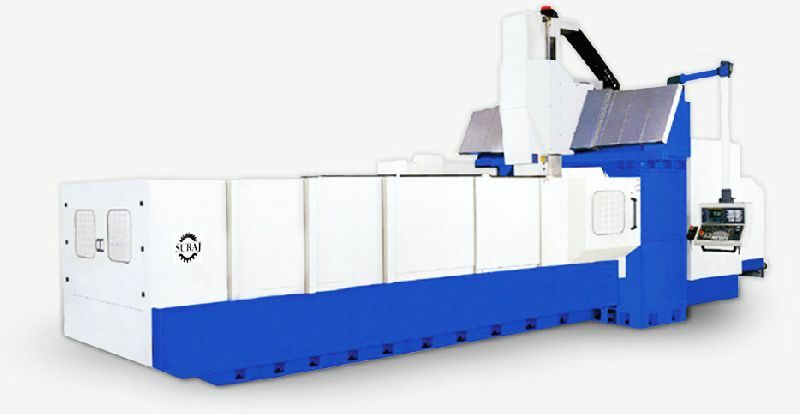 The specification of this machine like universal spindle unit its ratio is 1:1, maximum speed is 2.350 RPM, maximum torque is 2.500 NM, immersed depth of that machine is 350 MM and tool clamping is always manually and other features is robust and vibration free construction and high power rating to ensure accurate machining of jobs. In this machine one push button controlling the different function of the machine. It is used in hydraulic, lubrication and coolant system of a machine it passes through pumps, pressure relief, and pressure reducing and direction control valves. One set of rubber hose pipes with connections that are each type of pipe having the same number used in hydraulic, lubrication and coolant system of a machine. Another specification like longitudinal taper turning by horizontal head right and left both is +/- 30 degree and vertical taper turning by horizontal head spindle right and left both is +/- 45 degree. CNC Plano milling machine is available in stunning price. It provides the established design and latest manufacturing technology. The efficiency of old machine increased drastically. Since the change of table speed from high to very low, reduce maintenance and breakdown, wear and tear problem and an entire cutting load is taken up by CNC Plano milling machine.